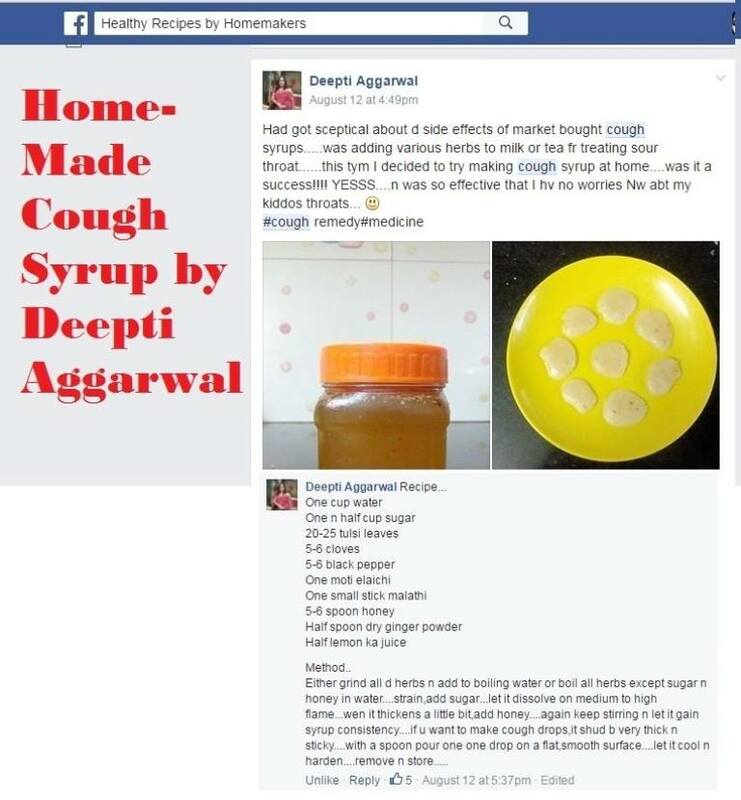 Whether you are looking for home remedy for cold or cough, this post can come in handy. What's so special about besan sheera, you might wonder. Well, the besan ka sheera is an authentic recipe from my grandmom's recipe book. I love everything about this besan halwa, which is made using gluten-free chickpea flour. Home remedies for common cold and cough are tried and tested and shared by our grandmoms. These home remedies of nanis and dadis are both effective and yummy. The monsoon is a time to enjoy rains 'n fall ill! Ooops, sorry but it's true for most of us! This is that time of the year when a number of us suffer from a severe bout of cold (yea - you may count those low on immunity). Yes, common cold can bring quite irritating symptoms. The changing weather also has an impact n our health. When autumn knocks at our doors, most of us tend to fall ill, especially those with low immunity. Nevertheless, I have come up with a delectable home remedy for initial cold symptoms. It is gluten free and yet so flavorful. 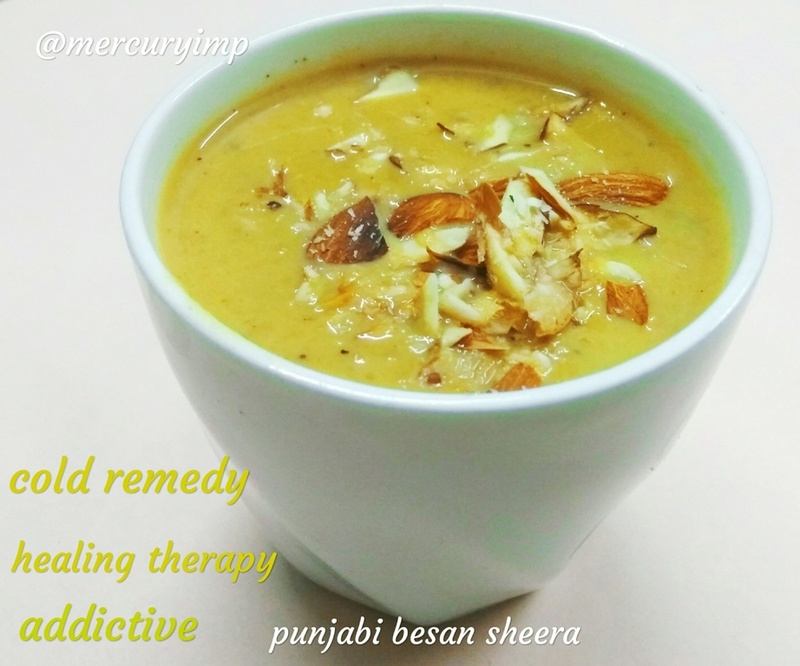 Here's presenting besan sheera - a popular dessert and remedy for common cold!!! The gluten-free remedy for cold or the milk besan sheera has been relished by my family since ages. This is exactly what makes it unique - the milk sheera is going to be a regular in your kitchens. Trust my words or try out the delectable cold remedy of besan sheera today. 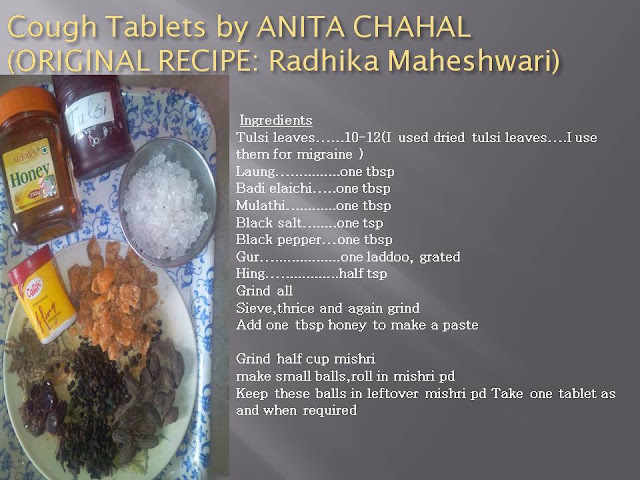 The winter recipe is the king of my grandmom's recipes. Nevertheless, I have come up with a delectable home remedy for initial cold symptoms. Add ghee to a pan. Add 1/4tsp of black pepper. Roast well. Then add besan and roast until the sweet aroma of roasted besan fills your kitchen! Of course, it will be little browned as well. Now it's time to add turmeric and ginger. Stir well. Then add milk in batches so that no lumps are formed. Keep stirring and adding milk. Give it a good boil. Do not boil too much if you want it to be soupy!! We do not want it to thicken like a gravy. You can add more milk if you wish to make it more flowy. That's it - enjoy every sip of this immensely beneficial remedy for cold :) Serve hot! 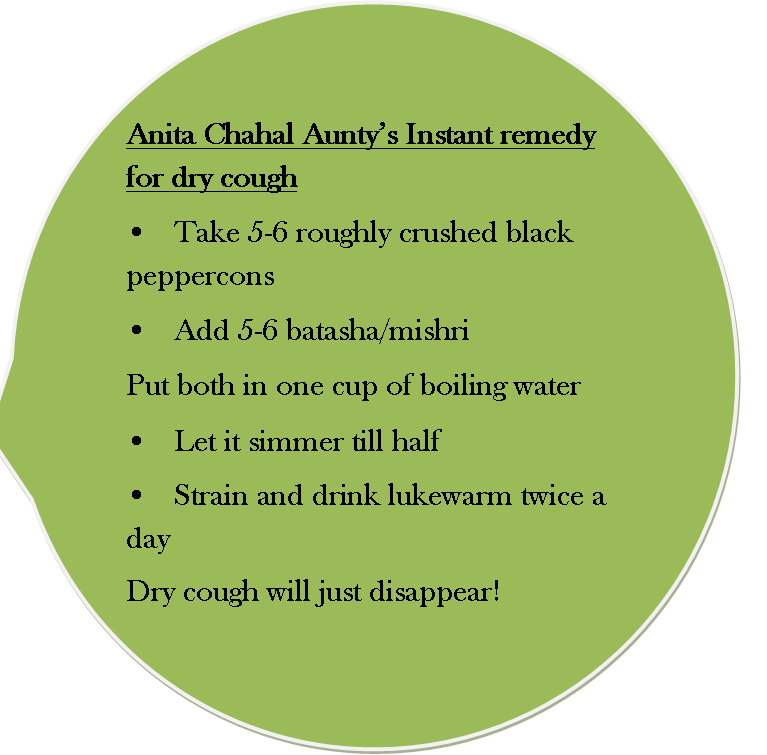 Here's one tried-n-tested dry cough remedy suggested by Anita Chahal aunty ji from my group "Healthy Recipes by Homemakers"